Is Southwest Minnesota State University Actually A High School? It has long been known that among the MnSCU universities, Southwest Minnesota State University is the leader by a wide margin in regards to participation in the Concurrent Enrollment (CE) program. CE is a program where students get both high school and college credit for their high school courses. The following figure shows the number of credits for which State aid was requested in the 2013-14 academic year. The MnSCU universities are highlighted in red. The data shows that in FY14 a total of 208,629 credits were taken by 59,749 students. The growth in CE has been incredible and the rate of growth is increasing by as much as 10% per year as the two-year colleges are ramping up their CE programs. 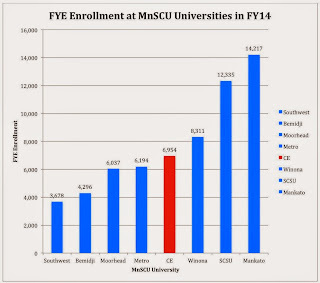 This new CE ‘university’ would have nearly twice as large an FYE enrollment as Southwest Minnesota State University and be larger than four of the MnSCU universities. 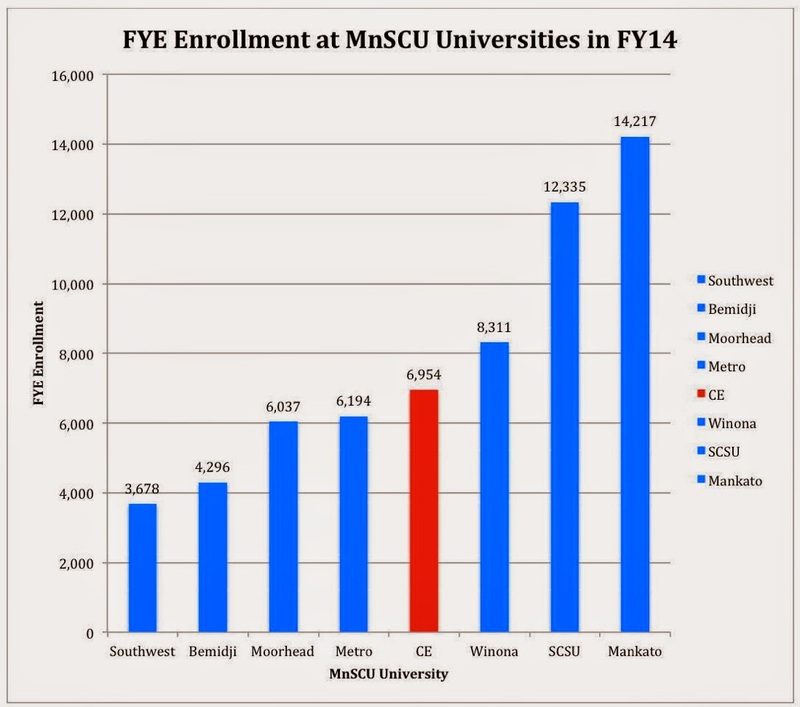 Given the growth in the CE program, it will be no more than two years before this CE ‘university’ would become the third largest in the MnSCU system. In FY14, there were a total of 1,023 FYE generated from CE at Southwest Minnesota State University and 2,656 FYE generated from on campus students. As a result, 27.8% of the FYE enrollment at Southwest Minnesota State University came from high school students—most of whom never set foot on the Marshall campus. In some ways, CE programs function much like online programs. From the data for FY15, Southwest has a total undergraduate headcount of 7,606. Out of this number, 5,022 or 66.0% came from students who are receiving college credit for classes taken in their high school. Since most of the students in CE programs never visit the university campus, it turns out that only one-third of the students enrolled at Southwest are actually on the Marshall campus! If you look at the headcount enrollment, with 66.0% of the students at Southwest Minnesota State University taking part in the CE program, a sizeable majority of the students are actually high school students. As a result, you might call Southwest a high school. Since the average CE student takes fewer credits than a regular on campus student, CE programs only generates 27.8% of the total FYE enrollment. As a result, Southwest may look more like a university. However, with the continuing growth of CE programs statewide, the number of freshmen and sophomore students will decline significantly in the coming years because many students will graduate from high school with their Associate of Arts degree. As the number of these ‘traditional’ students decrease and the number of CE students increase, the percentage of high school students will increase and the percentage of the FYE due to CE will also increase. At some point, it will be fair to question whether or not Southwest Minnesota State University is the state’s smallest state university or the state’s largest high school. This “cash cow” program actually hurts SMSU in the long run because (a) smart kids do not go to college where they went to high school, and (b) if the smart kids take English 151 in high school from their high school teacher, who is left to be in my English 151 class at the university?